If you sent us your address this year, you probably received a special Holiday card from us! This is the second year we've sent out Christmas cards, and this one definitely trumped last years. We really like paying attention to special detail in our work. This years card featured our holiday display that we assembled ourselves from recycled screen printing screens and wrapping paper. The photo was taken by our friend from Stillwater, Tyler Siems. I also did a special design collaboration with some amazing caricatures done byHector Lopez. Hector was the residential caricature artist of the late Oklahoma City Thunder. Check out Tyler's portfolio here, and Hector's work here. A big thanks to them for making this years card extra special. 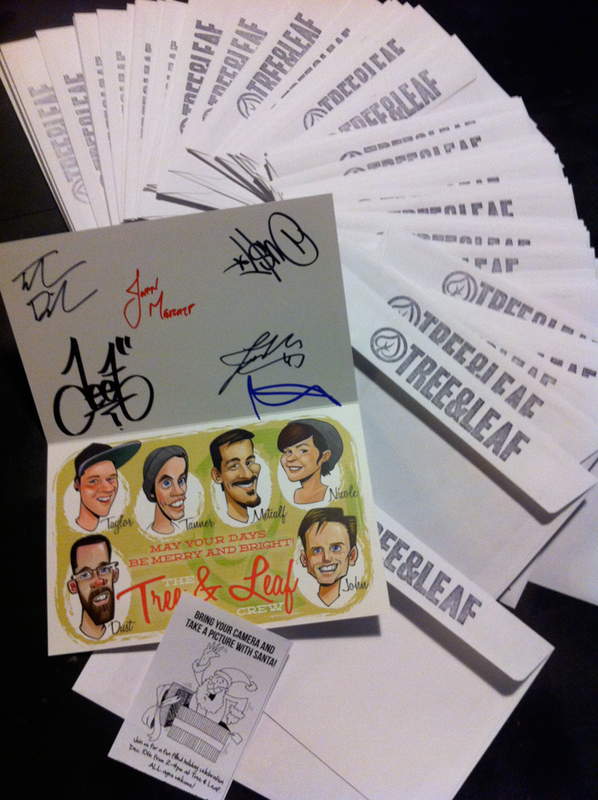 Each of the 500 cards wouldn't be special if all of the Tree & Leaf Crew didn't sign them, so we all destroyed our hands and signed each one!